Meer's has selected Loewen for our line of metal clad windows. Loewen crafts virtually every window style imaginable, each reflecting a distinctive fusion of Old World workmanship with new ideas in design and technology. Choose KV Custom Windows and Doors for design that will complement the architectural feel of your home and your personal style. We take pride in knowing that our product will be made in Ontario, by locally purchased machinery and by people who live right around the corner. Whether for a new house or the replacement of your doors and windows, Laflamme offers you a great choice of products as well as the flexibility that will allow you to carry out your project without constraints. 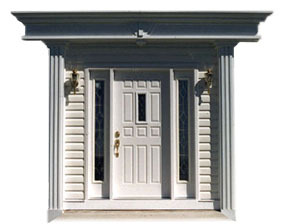 Security, energy efficiency and beauty - the entrances to your home should meet all of these conditions. Meer can advise you on what are the best options for your individual needs to provide you with designs and features to match any requirements. All of our work is backed with our own 2 year warranty on materials and workmanship plus the manufacturers warranty. We are dedicated to designing, developing and manufacturing the finest custom window, entrance door, and patio door products for our customers and their clients. We are passionate about supporting our country and province, ensuring that the rich history in manufacturing remains part of the Canadian infrastructure.